Being able to cook an adaptation of Julia Child’s infamous French Potato Leek Soup while in Paris is a dream come true. When we decided to take an extended trip to Europe in hopes that my husband’s health would improve, I knew it would involve shopping in the local markets for ingredients and cooking meals for us. I wondered what challenges I would run into? My biggest hurdle is not speaking more that a few words of the language, but everyone is kind and helpful, often they speak a few words of English and with pointing and gestures we can figure out what we are each saying and I can buy the items I want fairly easily. I wish I was better at French, but will likely pick up more phrases and words as we spend time in this beautiful city. The first challenge is the infamously small kitchens in Paris apartments. Most are smaller than the kitchens in my tiny studio apartments when I was young and single. Often a narrow galley shape, ours is a bit more expansive, but most assuredly designed for only one person to be in there working at a time. With two it is definitely a pas de deux! Bonus – we have a gas range!! I am so thrilled to be able to cook on gas again, but it does take some getting used to. I’m accustomed to the slow speed of our electric stove at home and had almost forgotten how instantaneous pans and food come up to temperature. I’m loving it! In most rentals, the kitchen has fairly rudimentary equipment to work with because most people are on vacation and go out to eat. Ours is well stocked with quite a few pieces to work with, but my favorite is a Le Creuset oval Dutch oven!! That is definitely going to get a work out and up first is my favorite potato leek soup! Have you seen the leeks in France? Instead of being 90% dark green with just an inch or two of white on the root end, these are at least half pure white and positively drool-worthy! I wish I could talk to a farmer and find out how they grow them to get so much usable white and light green. They literally take my breath away when I see them! There is so much usable stalk that I only need a couple of the slender leeks to make the soup instead of 4 to 6 of the regular American leeks! We love shopping in the neighborhood markets, picking up our items for dinner each day. In addition to the potato leek soup, we also had a rotisserie chicken with homemade gravy (in the small pan on the back of the stove) and fresh carrots. Simple and oh so good! These photos were taken with my iPhone in our Paris kitchen. No filters, no fancy lighting, just how we are living and eating while here. 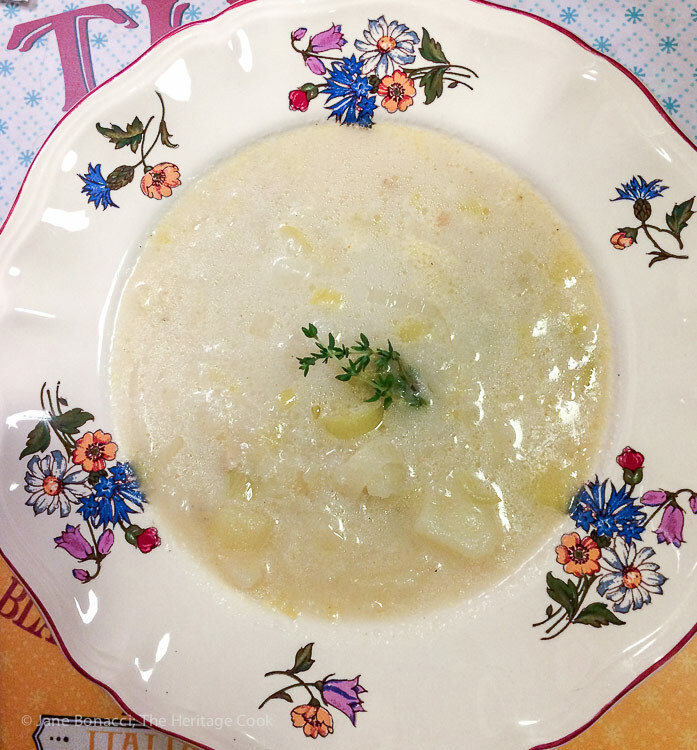 I hope you make this beautiful French Potato Leek soup when the temperatures dip and you need something to warm you up. When making it here in Paris I can imagine Julia standing beside me, guiding my hands as I make my version of her soup. Even picky eaters will love it – it is definitely one of my favorite ways to feed my friends and family especially during the holidays. There is nothing easier than having a pot of soup available whenever anyone gets hungry – they can serve themselves and give you more time to enjoy your guests. If you can’t find leeks in your grocery store, you can use mild onions instead. Try to find the mildest onions available (not “sweet” varieties). I often use onions to supplement if I can’t find enough leeks for the recipe. Shallots are terrific, but it would take a whole bowl of them! A blend of leeks, onions, and shallots is also delicious! This soup is naturally gluten-free! Leeks are usually grown in sandy soil and collect sediment and grit in the dark green portions as they grow. To clean them, trim off all the dark green leaves – you can use these to flavor stocks but they are too tough to eat. Split the leek lengthwise in half, cutting through the light green portion only. The white portion grows tightly together and rarely traps any sediment. Rinse leeks well under running water, separating the leaves to remove as much grit and dirt as possible. Even though you may think you have gotten all the dirt, still follow the recipe’s direction to soak in a bowl of water after slicing to remove the rest. Prepare the Leeks: Fill a large bowl with cool water. Slice the white and light green part of the leeks into rings and place in water. Swish around to release any grit and dirt. Set the bowl aside for 10 to 15 minutes. Impurities will settle to the bottom and the leeks will float. Gently lift the leeks out of the water, leaving grit and sand behind. Cook the Soup: In a large pot such as a Dutch oven, melt the butter over medium heat. Reduce the heat to medium-low and add the leeks to the pot. Cook, stirring occasionally, for 3 to 5 minutes or until leeks have wilted but not browned. Reduce heat as needed to keep from browning. Stir in the water. Add the salt, herbs, bay leaf, and potatoes. Bring to a boil over high heat, reduce heat to medium-low and gently boil about 20 minutes or until potatoes are fork tender. Add cream to the soup (if using) and stir well. Add pepper to taste. Remove bay leaf and discard. Taste and adjust seasonings as needed. Using a fork, potato masher, or flat whisk, smash a portion of the potatoes to thicken the soup. Leave it chunky for a rustic soup or puree completely with an immersion blender if desired. For a perfectly smooth soup, pass through a food mill to remove most of the solids. To Serve: Ladle into large soup bowls, garnish with chives or herbs, and serve immediately. Make Ahead: This soup is wonderful the following day, so make a day ahead and reheat over very low heat, stirring regularly. The soup will thicken as it cools but will loosen up again as you reheat it. By Jane Bonacci, The Heritage Cook © 2017 All rights reserved.